Tadao Ando is a world renowned Japanese Architect. He has designed a number of buildings on Jeju that show off his unique trademarks while incorporating aspects of Jeju’s culture. Tadao Ando had a very atypical beginning to his career as an architect. In fact, he never had any formal training in his field. Instead, after spending time in early adulthood as a boxer, he began to teach himself the skills required to be an architect by taking on apprenticeships with relevant people throughout Japan. During this time he would visit as many buildings as he could. Here he would study their features and designs and he was able to draw inspiration from everything from the traditional Japanese architecture in his hometown of Osaka to buildings he saw on trips to Europe and the US. A key feature of his designs and a feature that is prevalent in all his buildings on Jeju is the use of polished concrete. The tough nature of concrete means that buildings using it as their main material tend to have harsh straight lines and angles. However, Tadao removes this harshness by using these angles to focus our attention on the light, nature, and space of the surrounding area. Two of Tadao’s buildings, the Glass House and the Genius Loci, are situated in the Seopjikoji area near to Sunrise peak. The third, the Bonte Museum, is in Andeok Myeon close to the buildings of another great architect, Itami Jun. 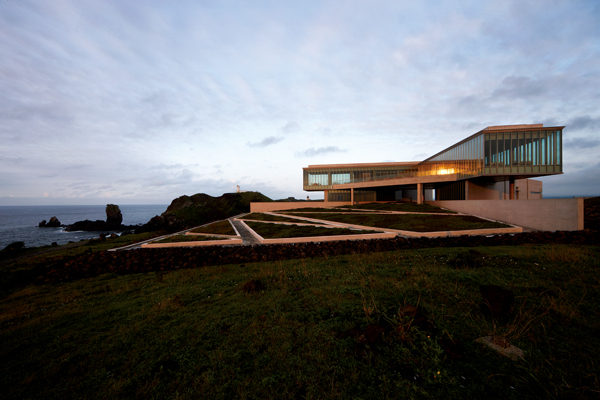 The first of Tadao Ando’s three buildings on Jeju we visited was the Glass House. Located on the Seopjikoji peninsula of Seongsan it is surrounded by beautiful nature, blue sea and great views of Sunrise Peak. The building is made from both glass and concrete meaning that the design is almost all straight lines and sharp corners. This gives it a striking, modern appearance. However, this doesn’t take away from the nature of the area and the building is designed to focus the visitor’s attention on the surrounding nature. Stood underneath the main walkway at the center of the Glass House, your sight is naturally drawn to the garden and then out into the ocean. In fact, the straight lines of the concrete frame your view and give the impression that you are looking at a highly realistic painting. Inside, there is very little decoration and the interior decor is almost entirely polished concrete. One notable feature of the inside is that on the second floor there is a cafe that sticks out from the rest of the building. This gives visitors the feeling that they out on a boat in the sea. A short walk from the Glass House is Genius Loci. While the Glass House encloses a restaurant the Genius Loci is simply a building and garden for you to enjoy. It is situated in a space that has been used for thousands of years as a place to meditate and seek illumination. As such it has many features that show the passage of time and help visitors find their own inspiration. This is shown in a number of features in the building including the constant slope you are walking on, the art inside the meditation chamber, and the combination of traditional Jeju stone walls and the more modern concrete. As well as the stones walls there a number of other features of the building that use local Jeju materials. 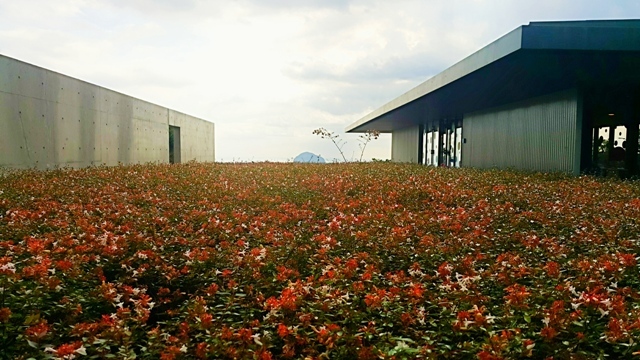 The three gardens, Wind, Stone, and Flower, use Jeju plants and stones as a big part of their design while the carpet of the meditation chamber is made from Eulalia plants native to Jeju. The main building of the Genius Loci is a meditation chamber. In here, there are three art media installations from Korean artists. The first is an animation of tree as it passes through the seasons, the second a 24 hour recording of yesterday’s sky and the third a real time recording of Sunrise Peak. 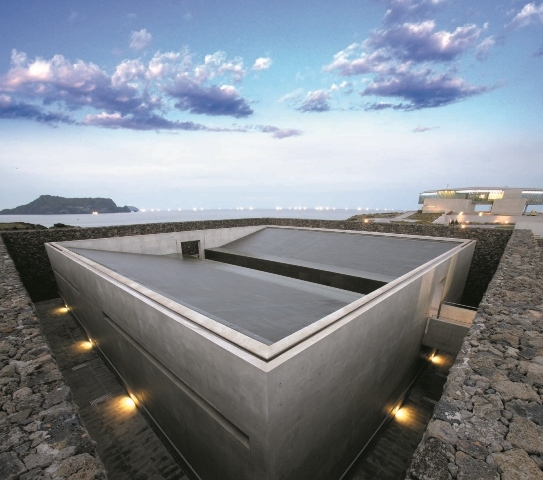 The Bonte Museum, a contemporary art gallery, may be situated at the the other side of Jeju to the Glass House and Genius Loci, but it is still very obviously a Tadao Ando design. Like the other buildings it is mainly made from polished concrete and it has the same straight lines and sharp corners everywhere you look. Also similar to the other two buildings is the fact that from the Bonte museum you are able to take in some spectacular views. 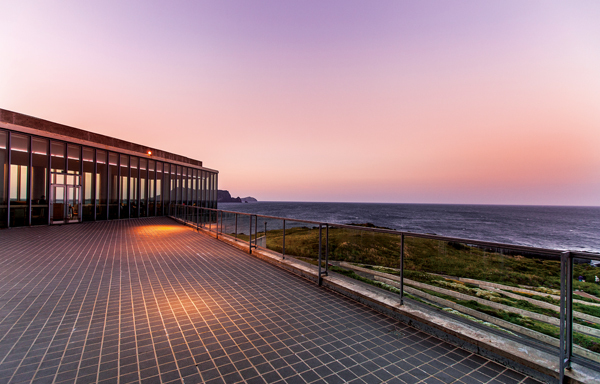 Its location high up on the south side of Jeju gives you great views of Sanbangsan, the ocean and the surrounding countryside. A noticeable feature are the inclusion of traditional Korean walls in the design of the building. These form an interesting contrast with the mainly concrete design. Perhaps the most spectacular parts of the building, however, is the water feature that runs between the two buildings that make up the Bonte Museum.